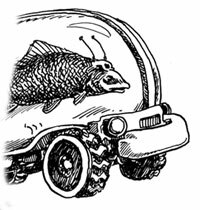 An advanced fish self steering transport. Where would fish go if they could travel on land. I have always wondered this. So I propose an experimental vehicle to find out. I have found a few similar ideas, but it seems they all require the fish bowl to acually roll. Well, not this one. Inspired by the Darpa Challenge (www.darpa.mil/ grandchallenge/) my design requires the fish bowl to be mounted on a 4 to 6 wheel drive system. There would also need to be a little computer and other special electionic items mounted on board (not my specialty). Basically the fish would have a small chip on or embedded in its head. The only info you need to get from it is what direction the fish is facing in and how fast his/her little tail is wiggling. This can be translated into speed and direction in the computer. I settled on the awd system because I thought the first experiment could be to leave the Fish Vehicle at the top of a beach and see if the little guy goes for the ocean. It would also be interesting to see what happens if you have multiple vehicles and fish that school together. The mental image is fantastic. It could give a whole new meaning to Land Shark. Definitely a conversation piece. You definitely have potential for the SciFi Channel. Innocent wonderings like this by well meaning but misguided mad scientists is what leads to horrors like the Cyborg Landquarium of Dr Zamondo - wheeled pirhana chasing down poodles, sawfish on Segways slashing passersby, enormous oarfish riding 10 motorcyles at once and jumping over 10 more motorcycles - ah yes. For you, an enormous bun in the shape of a monster car-crushing whale shark with overinflated tires. I think the attention span of most fish would make the vehicle incapable of winning the Darpa challenge. I like this idea, but unless you used a sole or a halibut, I think that the fish should have the same verticle freedom that they have in the ocean. Perhaps you could mount the fish bowl onto a Genie® mobile lift. Maybe I could use little bonsai dolphins... they have an attention span and procreate for fun. We may see them at the local Night Club. Interesting. The author posted this idea and anno, one other anno on another idea, the word "Hello" on his profile page, and then dropped out of sight. if the tracker keeps track of fish movement, and the fish is in the bowl. wouldn't the car go in circles? How did the slogan go? "Women need men like a fish needs a ..."? 9 years later. It appears somebody took my idea and translated it into the real world. No word on the schooling factor. Cool idea [zamondo]. I hope you receive royalties in the form of large pots of gold(fish). Always been a big fan of this concept, but watching the video I'm wondering if the stupid fish has any concept of surroundings outside the fish bowl. Make the little bugger work for his meals to test it out. Food is in the dining room. Drive your little car to the fish food dispenser to prove you're worthy of all this high tech we've put together to allow you to drive anywhere you want. The first few times you show it where to go of course, then see if it can figure out the concept of driving to dinner itself. Point is, now we have a fish car, but we're still no closer to knowing whether a fish can drive or not. One suggested improvement, get rid of the corners. They seem to confuse it. Make it a nice cylinder with minimum visual distractions. You could also have water flowing over it in the direction it's swimming to completely simulate the "swimming through the living room" effect but first I'd see if it could figure out that it's moving just by aiming itself in the direction it wants to go. Interesting. The author, who posted this idea and anno, one other anno on another idea, the word "Hello" on his profile page, and then dropped out of sight, returned and modified their profile page six days ago. Talk about passing like fish cars in the night - Welcome back, [zamondo]. The chip in the head is nice, but wetware remains a challenge still. I'd stick with cameras monitoring the behavior of the fish and some software to turn that into controlling motions. How do we know that what we think of as a fish is not, in fact, a small technologically advanced rodent in a fish-shaped submarine? By the absence of torpedo tubes, obviously.